This datasets describes a harmonized set of soil property estimates for Tunisia. It has been derived from the 1:1 million scale Soil and Terrain Database for the country (SOTER_TN, ver. 1.0) and the ISRIC-WISE soil profile database, using standardized taxonomy-based pedotransfer (taxotransfer) procedures. The land surface of Tunisia, covering some 164,150 km2, has been characterized in SOTER_TN using 250 unique SOTER units. Each map unit consists of up to four different soil components. In so far as possible, each soil component has been characterized by a regionally representative profile, selected and classified by national soil experts (see Dijkshoorn et al. 2008). Conversely, in the absence of any measured legacy data, soil components were characterized using synthetic profiles for which only the FAO-Unesco (1988) classification is known. Soil components in SOTER_TN have been characterized using 100 profiles of which 44 are synthetic. The latter represent some 59 per cent of the territory. Comprehensive sets of measured attribute data are not available for most of the measured profiles (56) collated in SOTER_TN, as these were not considered in the source materials. Consequently, to permit modelling, gaps in the soil analytical data have been filled using consistent taxotransfer procedures. Modal soil property estimates necessary to populate the taxotransfer procedure were derived from statistical analyses of soil profiles held in the ISRIC-WISE database ― the current taxotransfer procedure only considers profiles in WISE that: (a) have FAO soil unit names identical to those mapped for Tunisia in SOTER, and (b) originate from regions having similar Köppen climate zones (n= 3566). Property estimates are presented for 18 soil variables by soil unit for fixed depth intervals of 0.2 m to 1 m depth: organic carbon, total nitrogen, pH(H2O), CECsoil, CECclay, base saturation, effective CEC, aluminium saturation, CaCO3 content, gypsum content, exchangeable sodium percentage (ESP), electrical conductivity (ECe), bulk density, content of sand, silt and clay, content of coarse fragments (> 2 mm), and volumetric water content (-33 kPa to -1.5 MPa). These attributes have been identified as being useful for agro-ecological zoning, land evaluation, crop growth simulation, modelling of soil carbon stocks and change, and studies of global environmental change. 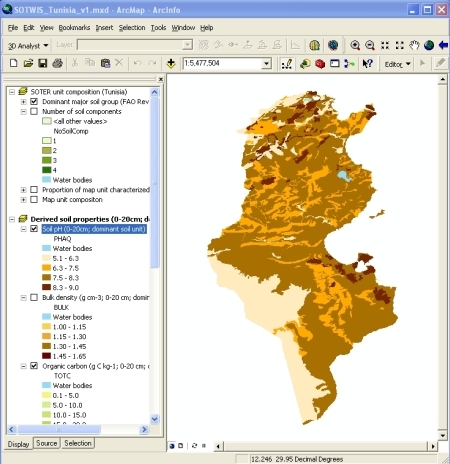 The soil property estimates can be linked to the spatial data (map), using GIS, through the unique SOTER-unit code; database applications should consider the full map unit composition and depth range. The derived data presented here may be used for exploratory assessments at national scale or broader (< 1:1 000 000). They should be seen as best estimates based on the current, still limited, selection of soil profiles in SOTER_TN and data clustering procedure ― the type of taxotransfer rules used to fill gaps in the measured data has been flagged to provide an indication of confidence in the derived data. 1) Batjes NH 2010. Soil property estimates for Tunisia derived from SOTER and WISE (SOTWIS-Tunisia, ver. 1.0). Report 2010/01, ISRIC – World Soil Information, Wageningen (41p. with data set). 2) Dijkshoorn JA, van Engelen VWP and Huting JRM 2008. Soil and landform properties for LADA partner countries (Argentina, China, Cuba, Senegal and The Gambia, South Africa and Tunisia), ISRIC Report 2008/06, FAO, Rome, and ISRIC - World Soil Information, Wageningen (28 p. with dataset). ec96be43-c10a-4580-8b6f-4db46ec29bbd Access to the portal Read here the full details and access to the data.